Collaboration is at the heart of the modern workspace, yet many businesses still run cumbersome client-side software that makes it unnecessarily difficult to work together. With Google Docs, coworkers can collaborate in real-time on documents, spreadsheets, presentations, and drawings. Instead of creating a document, sending it as an attachment, receiving multiple revisions, and then having to merge edits, with Google Docs everyone can work on the same version at the same time. If you've never tried our web-based documents, spreadsheets and presentations, now you can instantly take a test drive at docs.google.com/demo. No need to download any software or even sign in -- just start editing right in your browser. 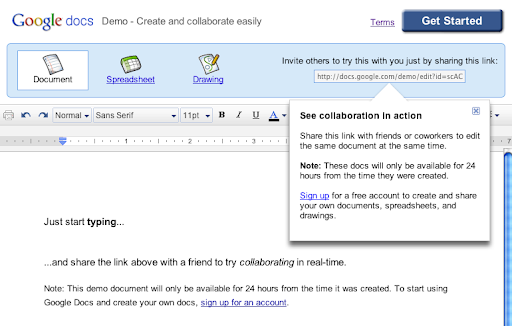 Better yet, you can share the unique link provided with others to try out real-time collaboration together. Google Docs is designed to help people be more productive than ever before. But don’t take our word for it, take Google Docs for a spin and let us know what you think. To learn more about how Google Docs make your teams more efficient, visit google.com/apps/docs. is that possible to bring data from other sites to google docs? just as task info, messaging related to the topic. I am building a enterprise collaboration tool online - thinkj.com and want to see if this is technically possible.